Commemorating the series of novels by acclaimed author Ian Fleming, the collection features authentic stamps released by the Royal Mail and mark the release of the new Bond thriller and sequel to Casino Royale, Quantum of Solace. The limited edition cufflinks are made from authentic British stamps and mounted in sterling silver. 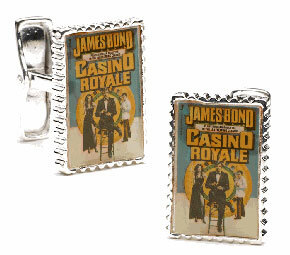 007 fans, cufflink aficionados and stamp collectors alike can choose from one of the three different paperback covers offered for the very first Bond novel, Casino Royale. Always sophisticated, perpetually fashionable, the James Bond Cufflinks Collection embodies today's well-dressed man. Ravi Ratan Cufflinks are exclusively distributed by Cufflinks, Inc. and can be found at www.cufflinks.com, department stores and men's specialty shops world-wide.